(Phys.org)—Researchers have fabricated a stretchable and transparent electrode that can be used for applications such as heating parts of the body and defrosting the side view mirrors on cars. It is the first stretchable electronics device made from metallic glass, which is a metal that has an amorphous (disordered) structure like that of a glass, instead of the highly ordered crystalline structure that metals normally have. The researchers, led by Ju-Young Kim and Jang-Ung Park at the Ulsan National Institute of Science and Technology (UNIST) in South Korea, have published a paper on the new stretchable, transparent heating devices in a recent issue of Nano Letters. While metallic glasses have been around since the 1960s, they have not been widely commercialized. Part of the problem is that they are expensive and the processing can be difficult, but part of reason for the lack of commercialization is also because the materials are still looking for an ideal application. So far they have been explored for use as cell phone casings, surgical instruments, and golf clubs, among others, but none of these areas has achieved great commercial success. The new study shows that metallic glasses have several properties that make them appealing for wearable electronics. Some of these properties include inherent flexibility, transparency, and stability under hot and humid conditions. "We think that the ductile properties of metallic glasses are well-suited for stretchable, transparent electrodes and heaters," Park told Phys.org. The researchers chose to work with a metallic glass made of a copper-zirconium alloy. They created a tangled web of the two metals by depositing them onto a sacrificial polymer web scaffold. The resulting metal web—or "nanotrough network"—can then be transferred to a flexible and transparent substrate and, due to the metals' conductive nature, used as an electrode. 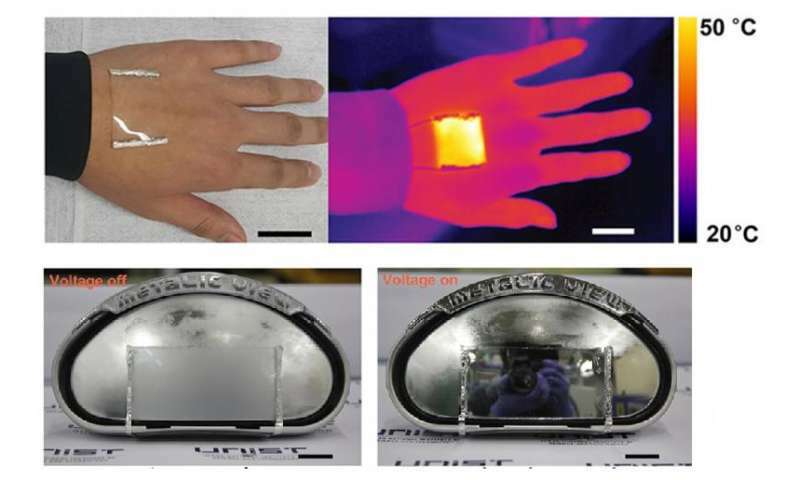 To turn this electrode into a heater, the researchers embedded the metallic glass web into a silicone material (PDMS), and then connected it to a voltage. The stretchable, transparent heating pad could reach a temperature of up to 180 °C (356 °F) while being stretched to more than one-and-a-half times its initial length with a negligible change in resistance. The researchers also designed a program to allow a user to wirelessly control the temperature with their phone, demonstrating how the device could be used as a skin patch for thermotherapy. Since the heater is transparent, it could also be integrated into the side mirror of a car, where its high temperature could quickly defrost the mirror on a cold day. Currently, the researchers are working on developing mass production systems for commercializing the new electrode. Other materials that have been used for stretchable and transparent electronics include carbon nanotubes, metal nanowires, conducting polymers, and graphene. 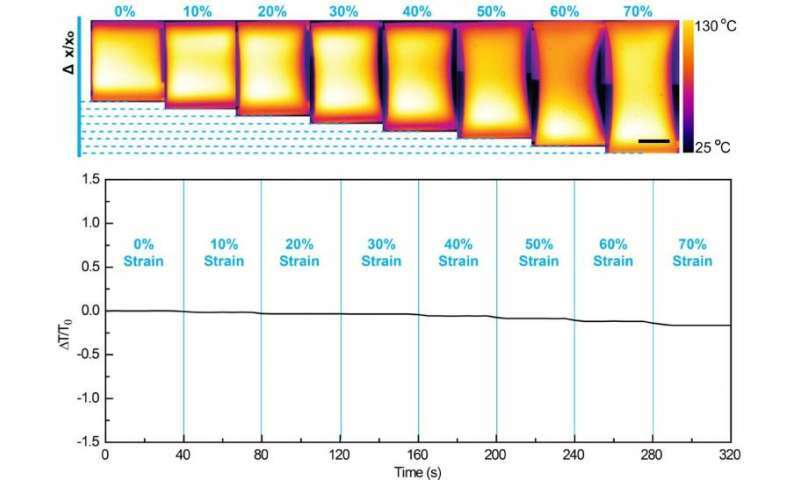 The results here show that the metallic glasses' chemical stability as well as its mechanical and optoelectronic properties are comparable to or in some cases better than those of the previous materials. Due to these promising results, the researchers plan to further explore the potential of metallic glasses for many other stretchable and transparent devices in future research. Depending upon how efficient and inexpensive this is, it might make a pretty good de-icing system for aircraft. Transparent, flexible and conductive. Sounds like a good substitute for fragile ITO used in touch screens of cell phones and tablets. Of course it might be too expensive, since zirconium is not that common metal. But for coming flexible OLED displays this might be the right material. @ab3a Heated wing and empennage leading edges have been around for decades. This product is specifically useful only where glass is currently used.